Alyssa and Isaac have escaped the walls of Paragon, seeking safe passage to join the rebel cause and find a safe house for operations. Their lives played upon a manipulated reality, realised with the aide of producer. The general population of Paragon, the former government quarantine zone, fear The Virus, a lethal illness brought into the city from over the walled compound. The citizens of Paragon, known as the ruling class, are being drugged to be kept compliant, unaware that their daily lives are being manipulated, right down to the nightly drama, where the 'actors' believed the soap was reality, both Alyssa and Isaac included. The goal? To produce a peaceful, egalitarian society, the first the world has ever seen. To mend communities after the world went to war, the millions of lives lost after the the missiles rained and the virus killed the weak and wounded... So they say. Their journey through harsh, unforgiving terrain is hungry work, with little rations now available. The two forge on with a quiet resolve, but something is terribly wrong. Something is hunting them, not quite human, but far more than a wild, feral animal. Whatever it is, is effecting Alyssa. She is having vivid nightmares and heightened emotional sensations. She is overpowered by grief, the loss of loved ones... And not just that of her own. Janie, Lizzy and Joe are missing, Nikhil has been captured, but a fate far worse has been destined for one of them, trialled for her involvement, she will be made an example of. If only she could remember who she is. As Alyssa and Isaac make it back to Paragon, unscathed, plans are put in place to move the rebels and those seeking refuge, to the new safe house. Not everything will go according to plan, they have a traitor in their ranks, animalistic hunters out for blood, and a revelation from the faceless men who control Paragon... Deemed worthy of a war that the rebels need to survive. Shudder was awesome. Where the first book in the series Stitched, posed more questions than answers, Shudder answered them... 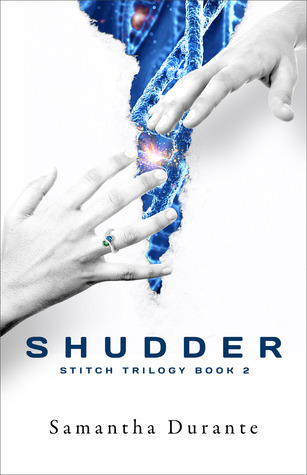 In abundance.The Stitch trilogy isn't your average dystopian series, it's intelligent, unique and will keep readers on their toes. I'm giddy at the prospect of the final in the series, it'll be epic.